Copyright 2013 by the author(s). Published here under license by the Resilience Alliance. 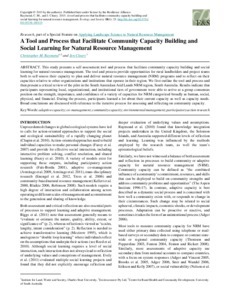 This study presents a self-assessment tool and process that facilitate community capacity building and social learning for natural resource management. The tool and process provide opportunities for rural landholders and project teams both to self-assess their capacity to plan and deliver natural resource management (NRM) programs and to reflect on their capacities relative to other organizations and institutions that operate in their region. We first outline the tool and process and then present a critical review of the pilot in the South Australian Arid Lands NRM region, South Australia. Results indicate that participants representing local, organizational, and institutional tiers of government were able to arrive at a group consensus position on the strength, importance, and confidence of a variety of capacities for NRM categorized broadly as human, social, physical, and financial. During the process, participants learned a lot about their current capacity as well as capacity needs. Broad conclusions are discussed with reference to the iterative process for assessing and reflecting on community capacity.